I’ve been a bride, and thought I did a pretty good job keeping my maids happy. No one had to deal with any crazy bridezilla moments (although, maybe you’d want to ask my sister and mom about that), and I’d hope I didn’t annoy any of them by talking about my wedding - a reasonable amount of times - during my engagement. But now that I’m a bridesmaid in two weddings this year, I thought I’d flip the switch and shed some light 💡on some things that truly make bridesmaids as blissed out as they can be during the whole wedding planning process. And I got some help from Le Rose, the experts in luxury keepsakes and fashion for the bride and her tribe - because being a well-dressed crew is pretty high up there on the priority list. Oh, these also go beyond sending a cute ‘will you be my bridesmaid?’ box just to pop the question. Gone are those days… especially now that brides have thrown out the simple bachelorette for more epic vacations with the girls. Disclaimer, though, things don’t have to be expensive. they just have to be cute, thoughtful, experiential in nature, and postable. Four things that millennials are pretty fluent in. Make sure you check out all our ways to make your bridesmaids feel awesome. Your sisters, besties, and the rest of the babes will totally appreciate it. We promise! 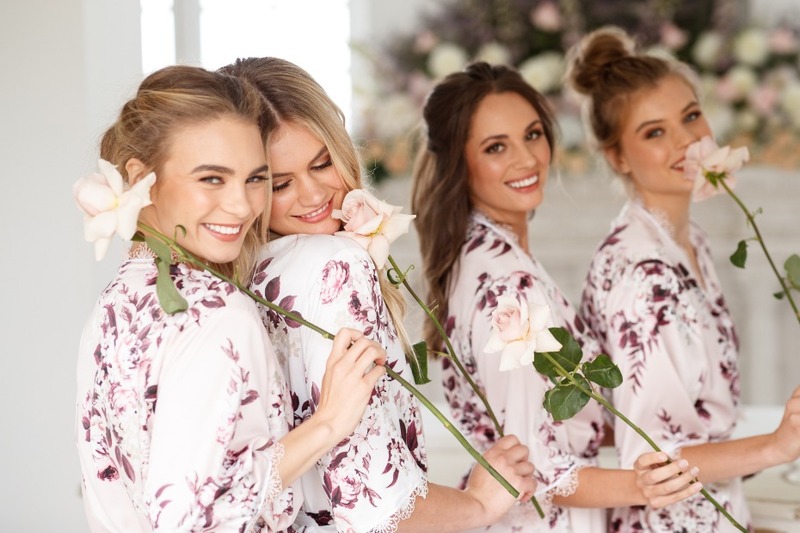 From matching pjs to pastel sweet treats and emoji-inspired pool floats, the things that can make bridesmaids smile are really all over the map these days. But there’s a certain amount of nostalgia that comes with them, too. The perfect bridal party experience is extra in all the best ways. And can involve a lot of throwback comforts. Yes, when the ladies sign up for your wedding girl squad, they know they’re part of just that. A squad. A collective. But when a bride can go out of her way to make each ask, event, gift thoughtful and personalized, it means the 🌎. That can seriously happen as simply as letting each girl pick her dress. Eliminating the one-size-fits-all archetype can take a bridal party from 😭 to 😁. A great bridesmaid situation also calls for some spontaneous and serendipitous activities, outings, etc. to liven things up, get everyone acquainted, and also ((sometimes)) to help shut the bride up a littleeee bit, when she’s getting too bridal for her britches. A good bride knows how to break up all the ‘me me me meeeee’ talk after a while. Especially if it means she can go to spa, drink all the wine, shop till she drops. We partnered with Le Rose to share some sweet ways to make your bridal party game next level. As always, thank you for supporting our sponsors!